Very good one! I wonder, was this planned or accidental? Thank you… after reading your explanation it jumped out at me! I don’t see any trousers. The guy is wearing shorts. Very good, once i read that i saw what was happening. I was convinced that this was Photoshop but it is just two tone shorts, good job. the guy with his back facing us is wearing two tone colored shorts. it just so happens the second persons legs are positioned right where it looks like they could be wearing the white part of the shorts. I no. Its a bit confusing, but ul figure it out eventually. The man, with his back to us, is wearing black and white pants (black on the sides and white in the center) which are covering the woman’s legs from the knees up. She is wearing a short, dark blue print skirt that is visible on the left side. two-toned baggy shorts on the man. grey with thick blue strips on the sides. The guy’s pants are white on the inside and blue on the outside. I see it now, that guy’s pants has 2 colors. You don’t see the girls pants or skirt at all. You actually see her skirt/dress if you look closer to the left of his waist up to he bottom of her arm. It looks like blue with small polka dots or flowers. Really good illusion. The guy’s pants are white and are split on the outside for about 6 inches up from the hems. The girl’s pants are baggy and blue. The inside parts are hidden by the man’s legs. It’s easier to see if you cover the middle two legs with your finger. the guy has 2 colours on his pants!!!!!!! The man is wearing blue and white shorts, and the woman is wearing either a skirt or a dress that is shorter than the length of the man’s shorts. His shorts are at just the right angle to where her legs are, giving the appearance that she is wearing white pants/shorts. Therefore, their legs are pointing exactly where they are supposed to be. Since everyone before me has ”decoded” the illusion, i would just say that this is fantastic illusion.One of the best i’ve seen for i long time. Great job, and thank you VURDLAK for posting it! sasostojki you are a great man and you absolutely nailed this illusion.You ARE THE MAN!!! Since everyone before me has ”decoded” the illusion, i would just say that this is fantastic illusion.One of the best i’ve seen for a long time. Great job, and thank you VURDLAK for posting it! hey, please help me to understand what or why you didn’t understand that thing. as it is totally obvious. The girl is wearing a dark blue print dress or skirt. The guy is wearing blue shorts with a pair of white pants positioned on his back so that it looks like she is wearing the pants. very good photo well captured. You’re all only partially right. Yes, his pants are dark on the outside and white on the inside, but if you blow up this picture, you’ll see that she is also wearing knee-length white shorts of a diffenrent fabric, so their two fabrics blend together, thus making it appear really strange, until you study it and find she is wearing shorts that are the same length as his. Nice. If you look closely at the picture, you can see the demarcation line, where the white (off-white) on his shorts stops and the whiter white of her shorts, begins. Yes, he has two toned shorts. That is the initial setup for the optical illusion, but what really causes our minds to create the illusion that her legs are in white Capri pants(behind him) is the curving line of the white inner part of his left side shorts leg and her right lower leg. They are in perfect alignment; creating an automatic assumption that she is wearing a pair of white pants. I guess a picture may be worth a 1000 words, but are they telling the truth. She has on a black dress with tiny light spots in it, he has on two tone dark and white shorts. doesn’t mean it’s any less brilliant. This WAS photoshopped. It is very apparent in the legs. I agree with the two toned shorts but its still a cool illusion and you have to look at it for a while! I agree with all above, but what the heck is hanging out of his waist band. If you look on the left you can actually see what looks to be part of a dress as well. That almost makes me lean towards this was accidental not setup. If it was setup they would have covered for that. Whatever the explanation, they look happy. Clearly, the guy with his back to us is an Absorber; he’s in the process of engulfing his prey. It does appear that the trick is in the guys shorts. No pun intended. The seem in his shots at the very bottom carries across in line. He shorts are two tone and because the girl’s blue dress is not lower than his crotch, where you can see through, it appears the the White peddle pushers belong to the girl, but they couldn’t. It would mean she is in front of the guy. His arms are folded in front of himself, otherwise that would spoil the effect. I don’t this was accidental, but a smart deception. Actually, he could be hugging her up high. I see a bit of what may be his arm on the right side. That is easy. All clothes you see are his. The trousers are two – colored. Her Legs look like they are extensions from the white part oft his trousers. Great illusion ! the black guys pants are lue and white. the girl is just standing there perfectly in the middle so it looks that way. and he is hugging himself to make his hands look like that. Finally, an easy one! There are three people. A woman is hugging the man but there is a person in between them. I think I jumped to conclusions. I agree with Carmen. If you put your finger over the white legs it all becomes clear. He just rockin some blue n white baller shorts, he ballin. The girl has her white pants hanging on the back of him. What a lucky and curious coincidence! Very clever. The reality is that the guys shorts are blue and white. The colors separate at the right place to make you think the person behind is wearing white trousers. Actually they’re wide shorts and you can’t see the person behind’s attire at all. This is what tricks the eye and make the illusion work. Can it be perfect matching white sleeves falling from the pull-over around his waist ? I got the illusien right away, but my question is this, does the guy have diapers on over his swim shorts? You spin me right round …. right round, like a record…. . Fun. His shorts are white with black stripes on the side. The white part looks like the other person’s legs. It’s the shorts who make the illusion.If you beleve this explanation is wrong,look…,the women is white and the men is black. simply cover the upper half (up to neck)by your hand & view the lower portion of man for some time, assuming his short in two tone, half black & half white. you will find the illusion. It’s the boy’s shorts. His basketball shorts are white and the sides are the blue-ish green color. And the girl’s legs happen to look like they’re coming out the holes of his shorts. I think the two toned shorts is the right answer. But it would also work if he had just white shorts on, and her skirt was being blown by the wind, so it wrapped around his legs a bit. The weirdo in the front has shorts that are white on the inside and blue on the outside. the white part was what’s supposed to look like the weirdo’s pants and the blue part is the idiot that weirdo is hugging’s pants. Or the idiot that’s hugging weirdo. She is wearing a dark blue skirt, you can see it a little on the left. He is wearing shorts that are blue along the outside of his legs, and white along the inside. He also has a white shirt or something on underneath the t-shirt and the bottom of it is sticking out into a weird point. Either that or something is tied around his waist. His shorts are black and white. Her dress is blue as you can notice at his left hip. The shorts are baggy to appear as if her legs come out. The guy wearing two tones shorts,the girl waring skirt. Never mind, just looked again, I was wrong. No need to add that comment. It’s an easy one. 2 people, 1 pair of shorts. The shorts are made up of 2 colors which helps to create the illusion. 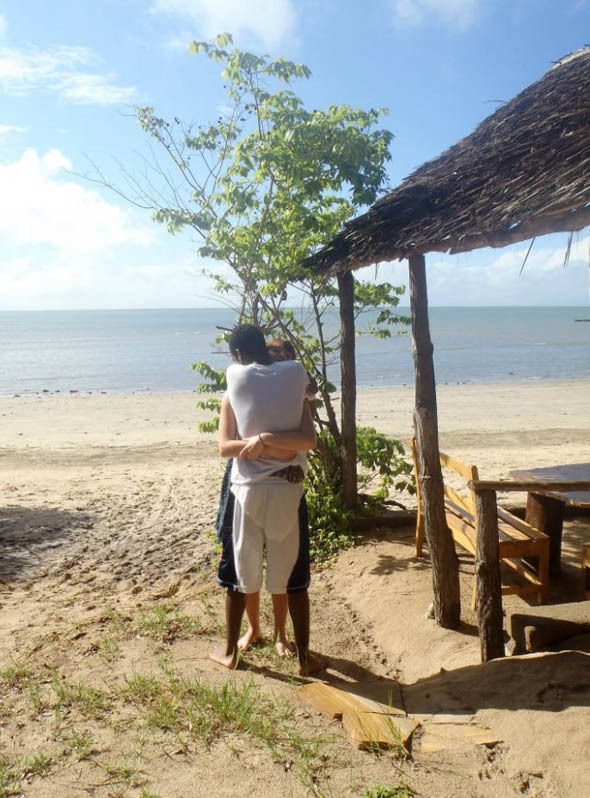 it is the black and white color of the 1 guys shorts, it makes it look like a person hugging him is in white shorts.